Cute, but still a piece of traffic. There has been a great deal of discussion about how these revolutions will proceed. (I have written about them here; Vox’s Tim Lee wrote about them here.) Among the questions are how fast they will develop and how they will interact with one another and with current infrastructure. Urbanists, who have been fighting for decades to shift the focus of urban planners away from cars to a more holistic vision, with a wider variety of transportation options (“multimodal”) and more land devoted to pro-social uses, are particularly interested in these interactions. For urbanists, these coming transportation revolutions might portend heaven — fewer cars, less parking, more places for biking, walking, and gathering — or they might portend a hell of more cars, more vehicle miles traveled, worse congestion, and more sprawl. Which of these two futures comes to pass, or what mix of the two, does not depend on technology. It depends on us — our willingness to discuss, debate, and plan for the future we want. This need for planning runs counter to the persistent strain of anti-government, anti-regulation ideology in the US. The whole notion of designing a future, rather than trusting “the market,” sticks in many Americans’ throats. But as a new study makes clear, we’re going to have to get over that. 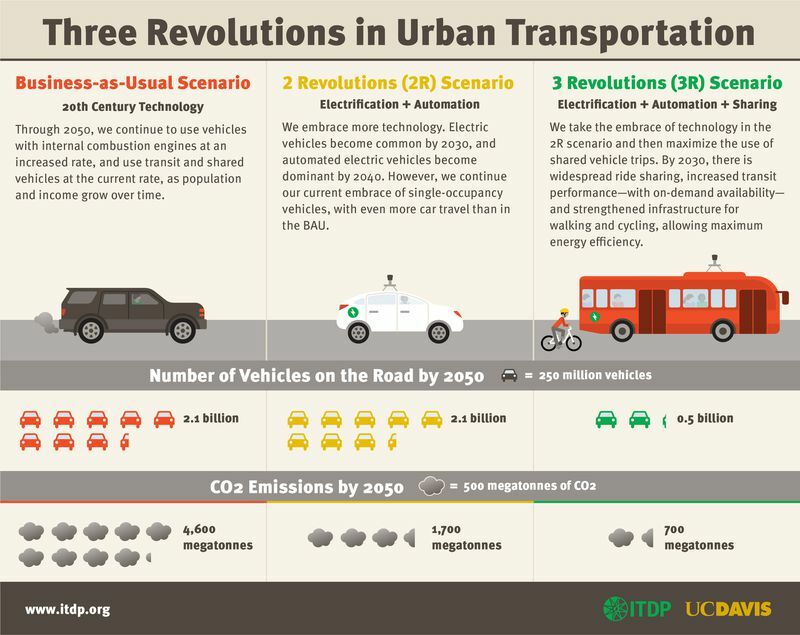 In late April, the University of California Davis and the Institute for Transportation and Development Policy released a report, “Three Revolutions in Urban Transportation,” that attempted to put some numbers on how these revolutions will play out. At the heart of the study are three scenarios, running out to 2050. In the first, business-as-usual (BAU) scenario, there are no revolutions. Privately owned, low-occupancy ICE vehicles continue to dominate, meeting the surging growth in demand in the developing world. In the second, two revolutions (2R) scenario, electrification and automation take off. EV sales rise from 750,000 in 2016 to 5 million in 2020 and rocket up thereafter. Full automation becomes commercial around 2020 and takes off in 2025. In both cases, costs fall rapidly and automated electric vehicles (AEVs) dominate new car sales by 2040. Oh, and the electricity sector mostly decarbonizes (an important caveat!). Meanwhile, ride-sharing does not take off and most cars remain privately owned and low occupancy. 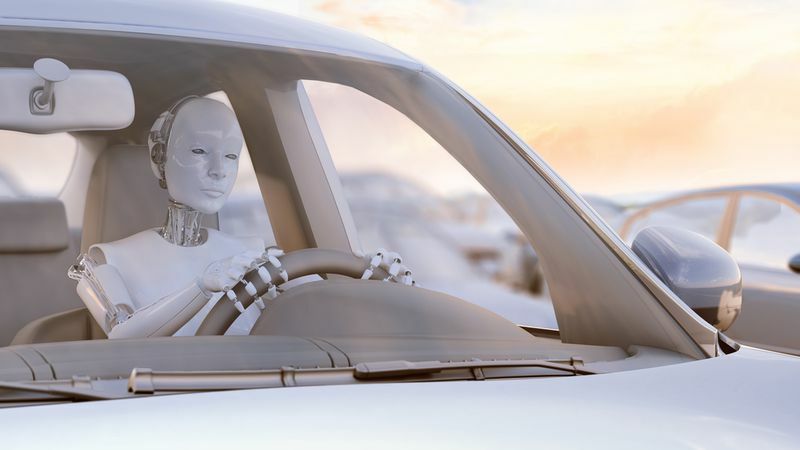 Because automation makes personal vehicle travel easier and more convenient, there is a 10 to 15 percent increase in overall vehicle travel and no reduction in the number of cars on the road. In the third, three revolutions (3R) scenario, electrification and automation take off and ride-sharing is prioritized, alongside a suite of policies that encourage multimodal urban transportation, resulting in “an ‘ecosystem’ of public transport and ride-hailing services that are harmonious and complementary.” Private ownership declines precipitously, the average occupancy of vehicles (especially in places like the US, where it is typically low) rises, and the number of cars on the road plummets. Obviously, none of these scenarios is likely to play out as described. It is impossible to predict how policy, technology, and social change will develop and interact, especially in a time of such tumult. But the scenarios can serve as signposts, rough indicators of the consequences of various choices. And they can tell us a lot about the political economy of the changes to come. Let’s pull out a few key lessons. If electricity is completely decarbonized by 2050, then electrification will effectively be doing all the climate work. Cars will have a free pass on carbon. Meanwhile, the urbanist work — reducing the number of cars on the road, improving urban livability — is done entirely by ride-sharing. The overlap between the two is, lamentably, fairly small. Climate hawks and urbanists have slowly been developing a closer relationship, which is all to the good. Urbanists try to recruit climate hawks to their cause by pointing out that smart density reduces carbon emissions. And it is true! Nonetheless, if your primary goal is to reduce transportation carbon emissions, urbanism is not the most impactful strategy. Electrification is, by a wide margin. This will be important to how the politics of these efforts play out. Urbanists are hoping to draft on the widespread appetite for decarbonization, but I think they may not get as much out of it as they hope. Ultimately urbanism will have to be sold on its own merits (which are myriad!). 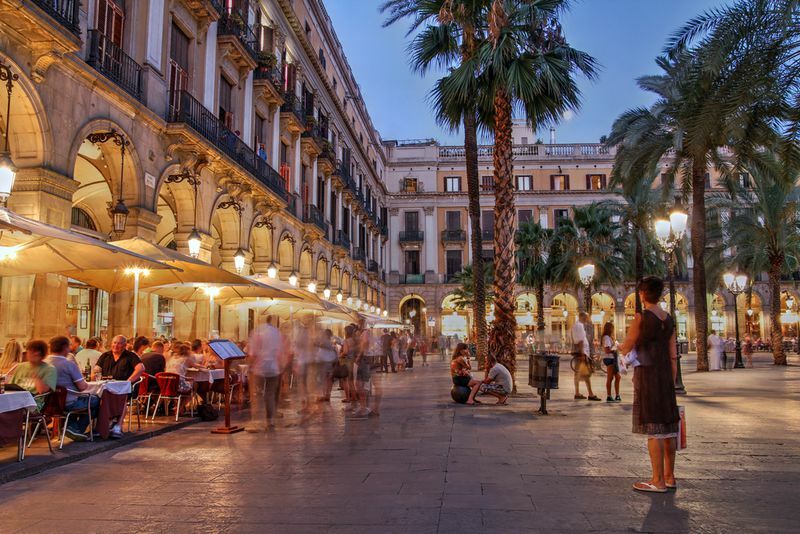 A plaza in Barcelona with no cars, autonomous or otherwise. The researchers found that the 3R scenario had the greatest cumulative social benefits — less energy use, less pollution, fewer cars, more multimodal, mixed-use urban space — and also, somewhat surprisingly, the lowest total costs. And they didn’t factor in the costs of avoided air pollution or carbon emissions, just infrastructure costs, labor costs (no drivers! ), maintenance costs, capital costs, and the like. 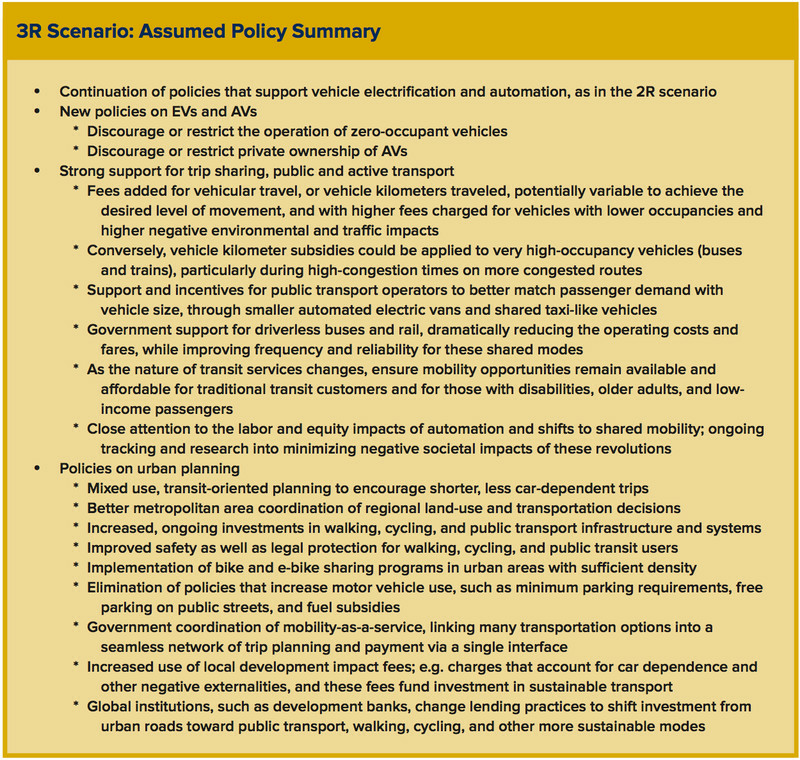 Because there will be many fewer cars in the 3R scenario, all those costs will be much lower. So 3R offers the greatest social benefit at the lowest total cost. What’s the catch? It also requires the most policy support. 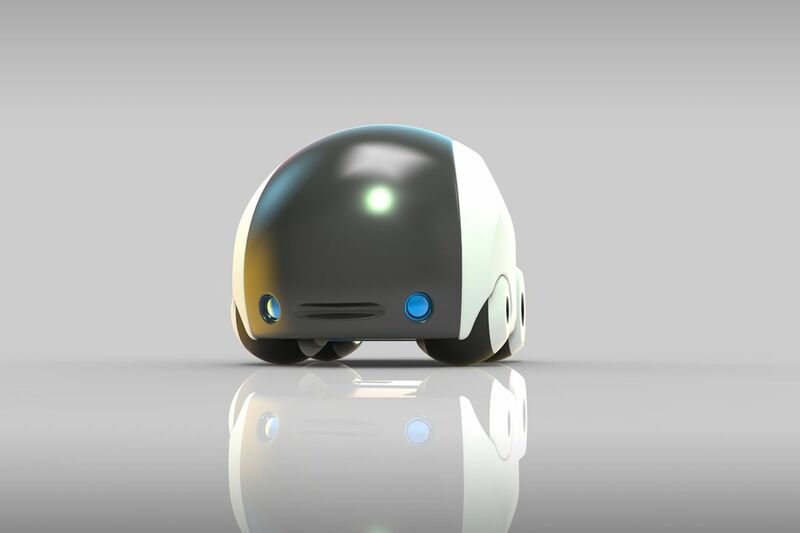 All things being equal, if AEVs get comfortable and affordable, people will want to own one. The more affordable they get, the more tempting individual ownership will be. The only way to counteract that is through policy to “discourage or restrict private ownership of AVs,” like it says on the list — or to develop shared alternatives that are so convenient and attractive that private ownership declines naturally. Meanwhile, governments will need to support the growth and development of fleets of 12- or 18-seat minibuses, to supplement (rather than replace) public transit systems, which they will also need to support. I find it a little difficult to envision. I can imagine central government policies supporting electrification and automation. I have more difficulty imagining a passion for urbanism sweeping across the world, playing out at the state/province and city level, everywhere at once, by 2050. But I like the idea! The wrong problem is: How do we make cars better? The right problem is: How do we make cities better? And when it comes to cities, there are simple limitations of geometry. 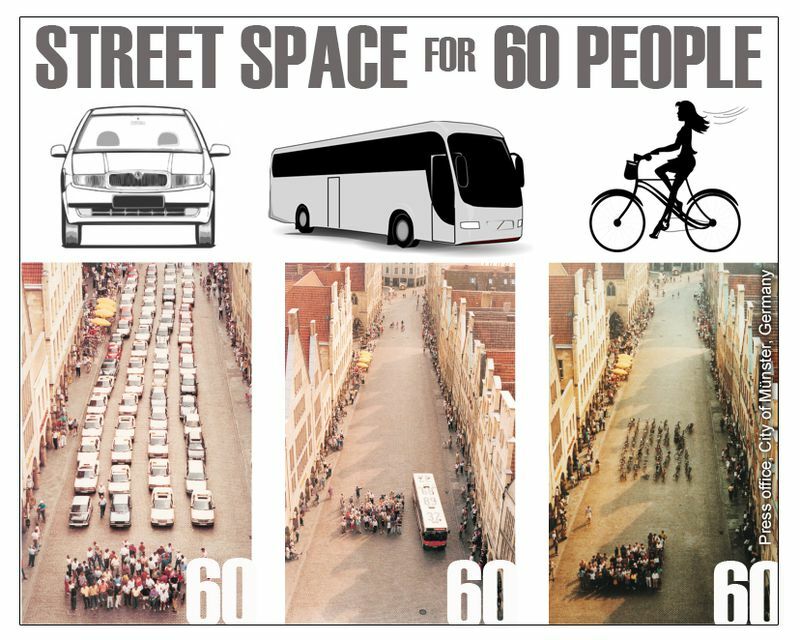 The scarcity of space per person is part of the very definition of a city, as distinct from suburbia or rural area, so the efficiency with which transport options use that space will always be the paramount issue. That’s why the UCD-ITDP report is very clear that when it talks about the ride-sharing revolution, it is not merely talking about ride-hailing — services like Uber and Lyft. Personal, point-to-point transportation does not solve the problem of geometry. Theoretically AEVs could free up some road space, through efficiency of dispatch and efficient driving, but not nearly enough to compensate for a large increase in vehicles. The only way to solve the geometry problem is to get multiple people into shared vehicles. That’s what subways and buses do — move lots of people using relatively little space. If they are to help at all in urbanist terms, AEVs must supplement and strengthen, not replace, fixed-route, high-capacity public transit. The report envisions a system like that: high-capacity, fixed-route rail and buses as the backbone, supplemented by shared, dispatchable AEVs in a range of sizes, from 18- or 12-passenger minibuses down to single-person pods. Vehicles can be “right-sized” for trips and routes can be optimized to minimize the number of needed vehicles. 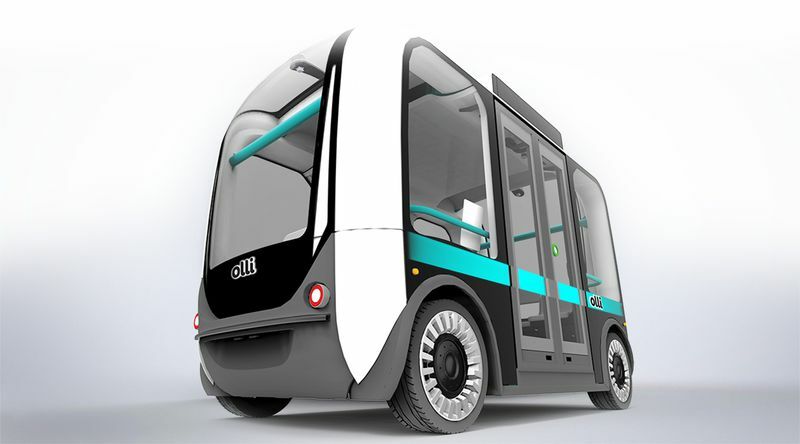 The Olli, an autonomous bus. Fewer vehicles, far more intensively used (and thus rarely parked), free up a ton of road and parking space that can be turned over to walking, biking, or socializing. And freedom from private ownership will collectively save trillions of dollars a year on costs. It’s a nice vision. But to be realized it must overcome two barriers. One is US aversion to active government. The other is an enormous amount of accrued habit and behavior on the part of affluent Westerners, particularly in the US, who are attached to the current system of private ownership and low occupancy. An alternative future that serves both climate and urbanist goals is possible, but only with farsighted planning and steady policy support. It will not happen on its own. Quintessential Education, a leading education provider, believes in automation and transportation improvement. Join our General Paper Tuition and Economics class and resources to learn more about the fine balance of the issues regarding these!